To celebrate Denis' special Birthday we have decided to take a train journey to Melbourne this weekend. We both really love train travel, and find it to be so relaxing. It must be the motion, noise and time out to just sit back and watch the world pass by! You could say passenger trains are an old school / retro form of travel. My parents went on a train journey to Melbourne for their honeymoon back in the 1960s. I think the trains have somewhat been updated since this picture was taken above. What a shame! It's been one week and things are already starting to take shape at our Retro Abode. 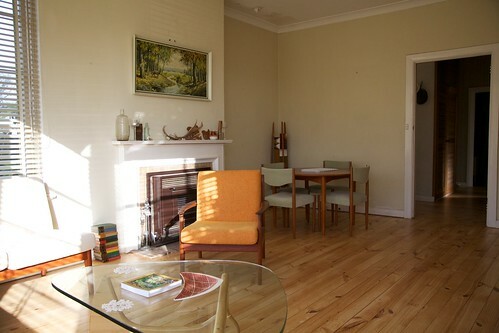 The floors have come up a treat, and with the old curtains gone the lounge room is now light, bright and airy. Just how I like it. Bring on the sunny winter afternoons! I decided that we needed a round dining table to fit the shape of the room better so luckily this week I found an original (mint condition) Parker setting with matching lounge suite in a gorgeous sage green on E-Bay. 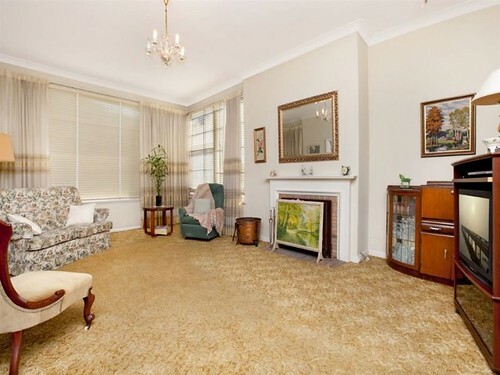 Now all we need to do is purchase a new light fitting, paint the walls, have the blinds cleaned, and bring in our floor rug once the floors have completely hardened in a couple of weeks. Oh yeah, and I must remove the skirt on the new retro lounge to reveal the teak legs! MATCHING PARKER TEAK DINING TABLE AND CHAIRS! It's official, I am obsessed with lounge suites! We now own 5, plus I just gave away 2! But I think this will be it as I think I have pushed Denis' patience to the limit! I just bought this one off eBay for $57 and it is a custom made 'Parker' copy in a gorgeous sage green velvet. Solid teak legs are hiding beneath the skirt, so I will be whipping that off when I get it! The suite includes a 4 seater lounge (2200mm long! ), a single chair and foot stool. In primo condition because it had resided in the "Formal Lounge" for all of its glorious life! And to top it off I also scored the matching Teak dining table and 6 x Parker Chairs! ($160). 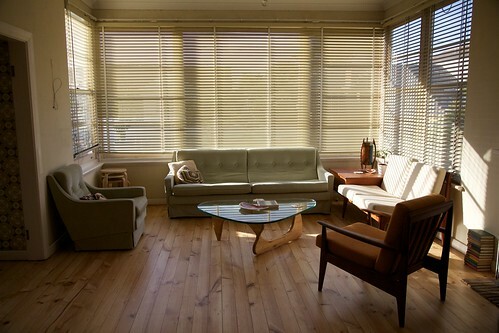 Perfect for our new lounge room at the Retro Abode! Will post more pics once the skirt has been removed and it is sitting pretty in our lounge! We picked up the keys to our Retro Abode last Monday and so the work has begun. Denis and I are so excited, it is still sinking in that we are now home owners and can't believe our score! 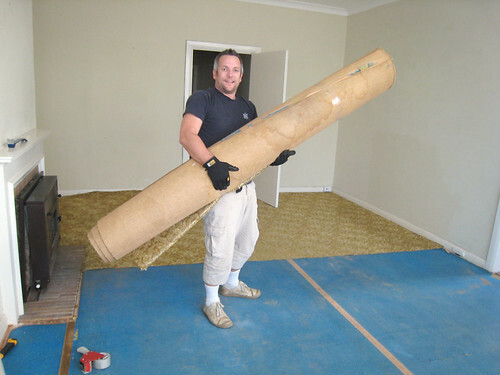 Our first job was to remove the carpet downstairs in preparation for the floor sander to do his thing this week. So Denis went to work Tuesday night. 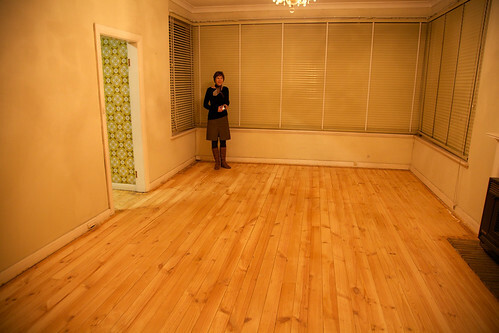 It is amazing what a difference it has made already by exposing the pine floor boards. I can't wait to see the floor finished! 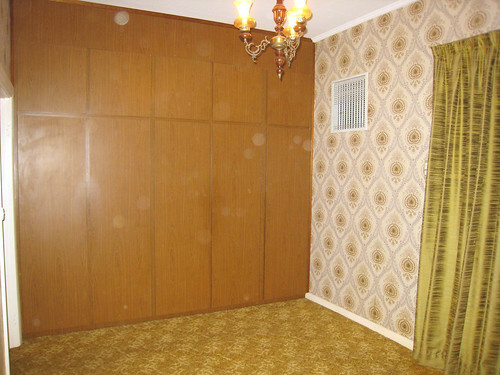 I also took down all the old net curtains. The rooms are now light and bright and open. We have decided to transform one of the back bedrooms into a cosy TV room. Our plan is to install some bi-fold doors to create an indoor-outdoor flow to the back garden. 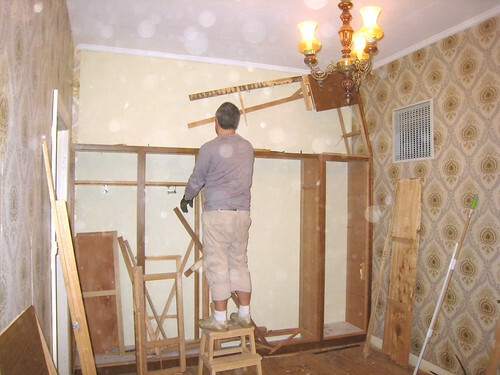 To start the transformation Denis removed the built in wardrobes. 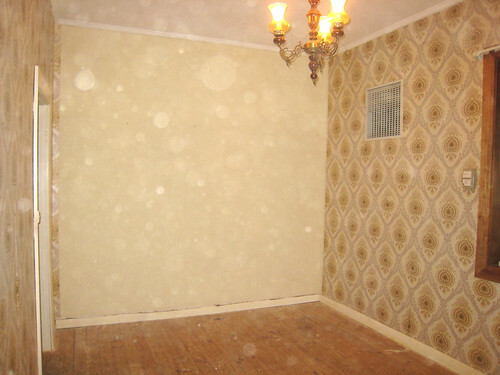 This room will eventually be painted because the wallpaper has faded in some areas. Even though the paper is pretty groovy, it is a bit much pattern for one room! Being the south west side of the house this room is asking for light walls!